Friday February 15 1907 I did not feel so very well but put in the time sewing. I am working on muslin for myself. Will busy about the place. He went in town in forenoon to get some one to fix well the pump is broke. It told in tonights paper that Walter Lee had died in California. Saturday February 16 1907 I was busy most of the forenoon in the kitchen Will had a man helping most of the day fixing the pump. They finished at 5.30. I got our suppers over and sewed in the evening. It was a very pleasant day. Sunday February 17 1907 It was a beautiful morning but I did not feel like going to church It was very late when we had breakfast. I got the meals and read and rested the most of the day and evening. Hattie tells me Emma McCallister is very sick. 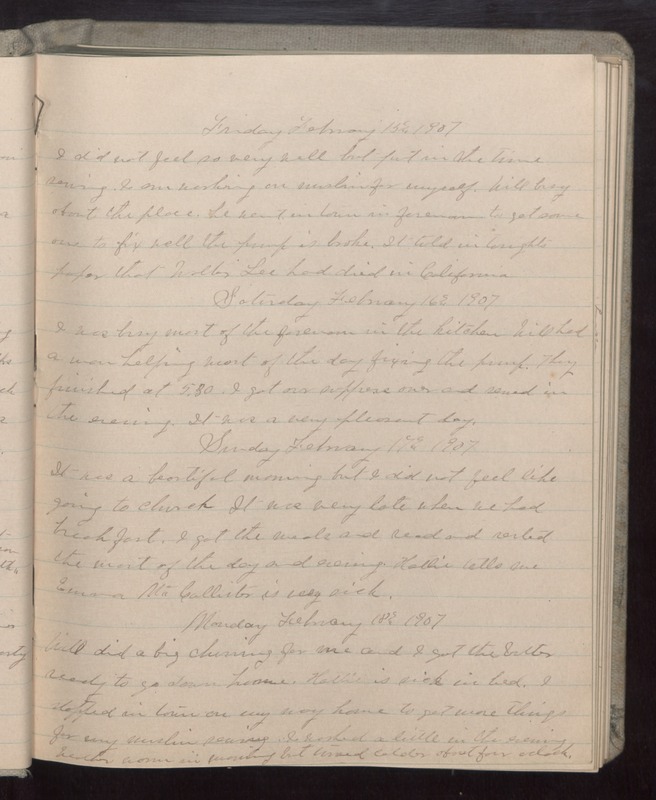 Monday February 18 1907 Will did a big churning for me and I got the butter ready to go down home. Hattie is sick in bed. I stopped in town on my way home to get more things for my muslin sewing. I worked a little in the evening Weather warm in morning but turned colder about four oclock.